Something seemed off when I saw this picture after Union had clinched its first ECAC Championship in Atlantic City in March. No, I do not mean that as a sarcastic comment about how far Union has come in its 21 years in the ECAC. I meant that a key element in the photo, the focal point even, was different than it should be. The Whitelaw Cup awarded to the 2012 Union College Dutchmen looked different than the Whitelaw Cup that had been awarded to previous ECAC Champions. I knew that it looked very different from the Whitelaw Cup awarded to Cornell in 2010 when I had the pleasure of watching that dominant team defeat a well-coached Union team to claim yet another ECAC Championship. I watched the 2011 ECAC Championships on CBS Sports and recognized that Yale's 2011 Whitelaw Cup was nearly identical to the one awarded to Cornell in 2010. So, I decided to research the history of the appearance of the Whitelaw Cup. The results of my search are posted above in a gallery of six Whitelaw Cups awarded over the span of seven years. These were the years for which it was easiest to find an image in which the form of the Cup was readily discernible. As one is always able on WAFT, click the images if you want to view a larger version for better comparison. The trend is fairly pronounced. The appearance of the Whitelaw remains relatively constant from Cornell's eleventh Whitelaw in 2005 through Yale's second in 2011. The slight variation that is noticeable is that the Whitelaw had a less polished patina in the earlier 2000s than it did in 2006. Notwithstanding the brilliance of the finish of the Cup, very little changed in its appearance. It maintained the same shape and general appearance. The form of the Whitelaw changed drastically some time between March 2011 and March 2012 when Union celebrated with it on the ice of Boardwalk Hall. Maybe it was the seabreeze. Maybe it was the Jersey Shore. But, the Cup increased in volume by what appears to be a factor of four. The accessory, understated handles on the side of the Cup grew. They extended from the base of the Cup to the top, scrolling into the beveled opening, much unlike the small handles that extended only slightly from the base of the Whitelaw that Yale, Princeton, Harvard, and Cornell hoisted. The height of the Whitelaw grew considerably too to about 1.25 the total height of the trophy. The next thing I looked at to see exactly how much history and tradition was altered within a matter of one season of hockey was to check what Whitelaws from further back than 2005 looked like. The only place where I knew that there were many on displays was Cornell's locker room in which a large portion of the collection of trophies that Cornell has won are displayed. I used a video in which Schafer was interviewed in the locker room to get a glimpse at what those previous trophies looked like. I've pieced the images together into a panaroma, found below, of the view of the trophies from part of the locker room. An array of some of the trophies that are displayed proudly in the Big Red's locker room including some of Cornell's twelve ECAC Championship trophies. The appearance has remained fairly constant from 1967 through 2010. The dates on each trophy cannot be deciphered. However, based upon the timing of ECAC rebranding and the 2005 photo in the above gallery, one can conclude that the trophy in the center is Cornell's 2010 Whitelaw. The 2005 photo in the above gallery appears most similar to one of the other three similarly looking cups in the photo (the far left and the two rightmost). That leaves two trophies that look nearly identical to the trophies in the above gallery (2005-11) remaining. If one assumes that the four ECAC Championship trophies pictured are Cornell's four most recent ECAC Championship wins, the oldest would have been won in 1997. That would mean that the Whitelaw Cup remained unchanged for at least 14 years. Why the change? I checked the ECAC Hockey website and press releases to read what was said about the Whitelaw Cup in formal press releases. I was suprised pleasantly to find that the ECAC press release that describes the Whitelaw Cup includes a photograph of a representative Whitelaw. It is below pictured. The formal ECAC media release that describes the regular-season title trophy and Whitelaw Cup. It shows a representative Whitelaw Cup. The representative Whitelaw Cup looks like those won from at least 1997-2011, but likely even earlier. It looks very different from the trophy that Union received in March 2012 at Boardwalk Hall. I expect that when a trophy changes in a conference that alleges that it takes itself and its history seriously that there would be a public announcement regarding the redesign of the trophy. Hockey East did this in 2008 when it redesigned its regular-season championship trophy. Why didn't the ECAC do the same with such a drastic trophy change for the tournament championship? The ECAC is currently the second-oldest collegiate hockey conference in the nation. It will be the oldest conference when the 2013-14 season begins. The only way that title is challengeable is if people argue that retention of one charter member (Michigan Tech) in the WCHA Lite makes it the clear heir to the historic WCHA. I am not convinced that it does. I digress. The ECAC is at least the second-oldest collegiate hockey conference in the nation whose constituent members include the oldest universities in the nation to sponsor NCAA hockey and the oldest hockey programs in the nation. The ECAC Championship is the second-oldest collegiate hockey tournament championship recognized in the nation. The WCHA crowed its first champion in 1952. The ECAC crowned its first champion in 1962. The CCHA did the same a decade later. The ECAC Championship trophy was named in honor of former ECAC Commissioner Robert M. Whitelaw in 1989. 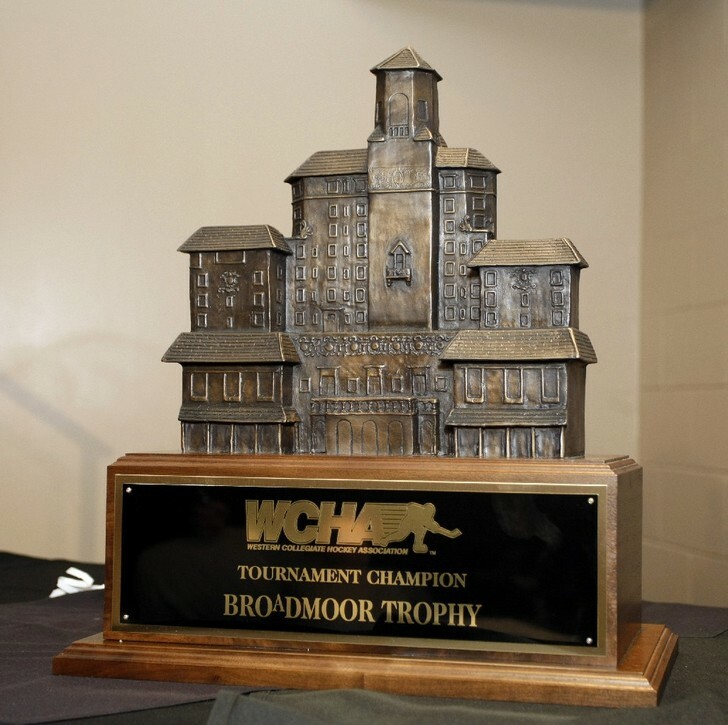 The Broadmoor Trophy became the standard WCHA Championship trophy in 1985. The Lamoriello Trophy did for Hockey East in 1988. The CCHA Championship trophy was not recognized as the Mason Cup until 2001. By either metric, the Whitelaw Cup is one of the oldest and most historic tournament trophies in college hockey. Three of the four named historic tournament champion trophies have one thing in common: absolute consistency in appearance over most of their lifespan. The Broadmoor Trophy, Lamoriello Trophy, and Mason Cup follow this trend. The Whitelaw Cup does not. The appearance of the Whitelaw verifiably remained unchanged from at least 1997-2011. It likely was unchanged much longer. Even if the simplistic cups in Cornell's locker room that are not indentifiable to an eye, such as mine, that has not seen them in-person are earlier versions of Whitelaws, why the change now again? Moreover, why the change in 2012 without any publicity? The ECAC celebrated its move back to Lake Placid as the appropriate choice with claims emphasizing the historic nature of the league and once-and-future host venue. I am sure that in 2014 there will be no shortage of marketing that heralds the ECAC Championships in Herb Brooks Arena as "the oldest and most legendary hockey programs in college hockey in the most famous hockey arena in the United States." It is a nice catchphrase, but as a conference and fanbase if we do not value the history and prestige of our most prestigious honor, do we really deserve such appellation? Can we really claim that we care that much about the history of the conference and winning its grandest trophy if we allow the embodiment of that achievement to change without questioning those whose hallmark decisions include moving the tournament outside of the league's geographic footprint for increased television coverage and then having no such coverage but a year later? I've offered many questions, but few answers. I am not sure what the answers are. But, I know that it is wrong when a historic conference abandons its traditional trophy, the one that even appears in its formal press releases still, and the first that loyal fans know of this is when it is handed off to the captain of that year's championship team. I hope that it was just the Jersey Shore getting to Mr. Whitelaw. He made some bad decisions and ended up not looking quite the way he used to. Maybe it was the G.T.L. lifestyle or the gambling or the women. Maybe he hired a double when he realized he would not be on national televsion. Maybe all of the above. But, I hope that the ECAC and Mr. Whitelaw will take this as a sincere invitation to bring the original back. We preferred him. The version that was rolled out in 2012, even though in some ways more aesthetically pleasing, was not a Whitelaw Cup. That version deserves to suffer the same fate as the television show referenced in the title of this post and the ECAC stint in Atlantic City.